Make a lasting impression with your family, friends, employees, or business associates by entertaining them in one of the most significant and distinct venues in the world. 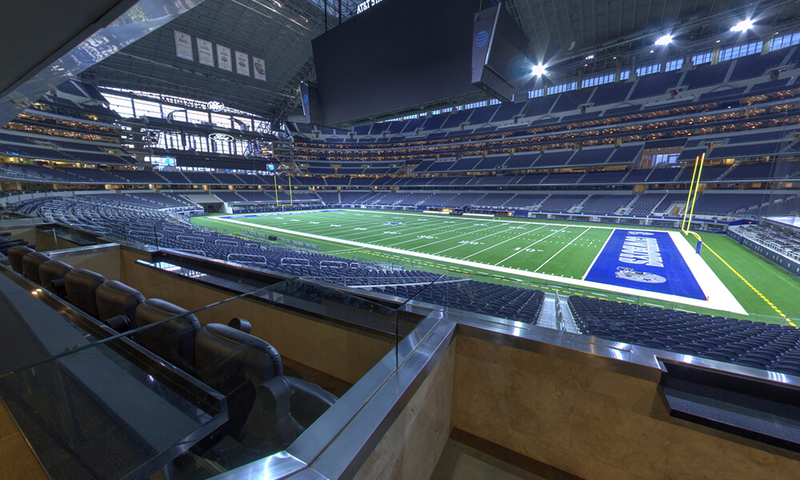 An AT&T Stadium luxury suite offers elegant and luxurious surroundings with an unparalleled view of the game, concert, or special event. Our suites feature granite counter tops, marble floors, a private restroom inside the suite, ample bar space, flat screen televisions, climate control, Legends Hospitality, Wi-Fi, Silver Club access, Main Club access, and special suite parking. A limited number of Star Level suites are available. Individual event suite rentals include tickets for the number of seats in the suite facing the field and suite parking passes. Availability, event, rates, & suite sizes are subject to change without notice until the suite is reserved. The SRO ticket rate may vary depending on event. Yard line suites are not available. *Up to 8 additional standing room only (SRO) suite tickets are available for purchase. Ticket cost will vary depending on event. The suite and views provided herein are for illustrative purposes only. Specific suite location and views are not guaranteed. Plastic, vinyl or PVC and do not exceed 12"x6"x12"
Approximately the size of a hand with or without a handle or strap. No larger than 5.5" x 8.5" with or without a handle or strap. Can be carried separately or within an approved plastic bag. For details regarding AT&T Stadium tailgating policies, please click here. All guests looking to claim or report lost items should do so at the nearest Guest Services Center. Guests inquiring about lost items at previous events should call the Guest Services Hotline at (817) 892-4161 for information or notify us via email at lostandfound@dallascowboys.net. Items lost at prior events are held in a locked storage area for 60 days and are then either disposed of or donated to an appropriate charitable organization. 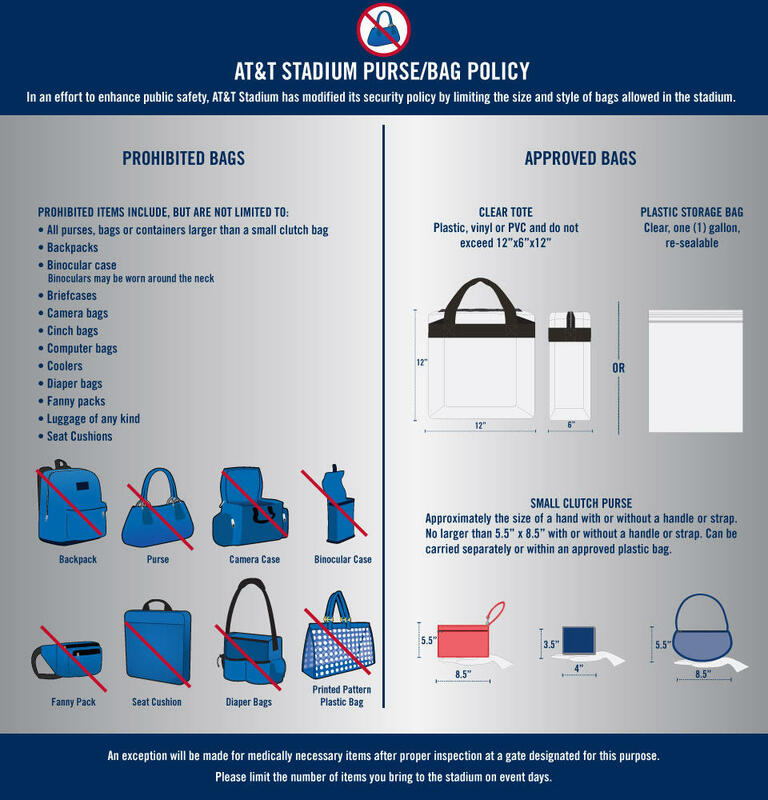 AT&T Stadium cannot be held responsible for lost or damaged items.